Save money on the road. •	Optimized for fast data and maximum battery life. And it’s free to truckers! Trucker Tools has the accurate list of truck stops and real-time fuel prices. Search for nearby truck stops, number of parking spaces, showers, 24 hour operations, or by name, city or highway. You can also narrow your selection by amenities such as CAT scales, bulk diesel exhaust fluid and TripPak. 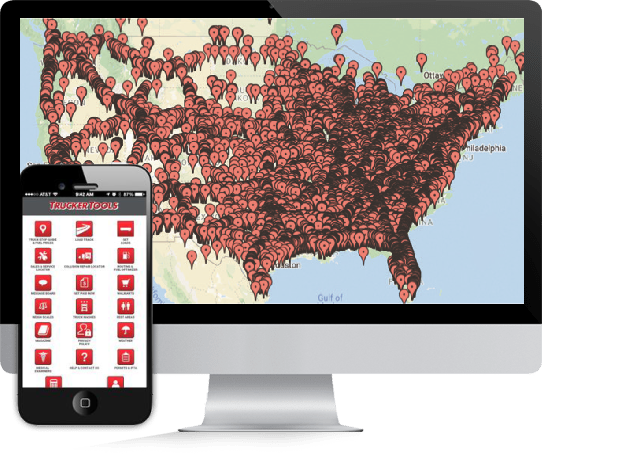 Using the Trucker Tools Routing and Fuel Optimizer you'll get truck routing with turn-by-turn directions, locations with the cheapest fuel and truck stops along the route. Three different options let you optimize fueling buying to meet your needs. "Deleted all other apps this is all I need!!!! [9 thumbs up]"
"Great idea. Super easy to use down to earth approach." "If you don't have this app, you are definitely missing out. This the most useful application I've got. I love it." "One of the best truck tools there is out there and I love it. I use it everyday when I'm on the road." "Best trucker app! This is the best trucker app! Works right from the start. No b.s.! Love it! :-)"
"Everything you need it's right here. I love it." "GREAT TOOL! I use trucker tools almost daily to find good locations to stop for the night. It's great for finding independent truck stops on those nights when the big name brand truck stops are filled up. Also a great tool for finding Walmarts." "Love this app. Very helpful in finding cheap fuel along my route." "This is the best tool going for truck drivers. I cannot work without it." "Very helpful. This app has so many great tools. I'll keep it as long as I'm a OTR driver." "I love this app. It has saved me many times. I definitely recommend this app to other professional drivers. I can’t thank you guys enough for this wonderful app." "The best as far. Doesn't just pull up the major truckstops but the small mom and pops to! Better than pay truckstop apps." "Great app. It's got almost everything. Kudos." "Excellent app. A must for truckers." "I think this a great app for us truckers that need accurate truck stop info at their fingertips, I love it. The fuel prices are great, helps me save a few pennies on most trips..."